Adding A Motion to The 2018 NCC Constituency Agenda? Make Sure It's Not Conservative! Two weeks ago we reported on two motions that were properly submitted to the Northern California Conference (NCC) Executive Committee to be included on the Agenda for the 2018 NCC Constituency meeting. They were rejected by the NCC Executive Committee, denying many concerned Seventh-day Adventists in northern California the right for their concerns to be heard and voted on. There are at least two other motions submitted to the NCC Committee by the Golden Feather Seventh-day Adventist Church. These motions were denied in the same manner as two motions that were submitted by the Sacramento Central Church. 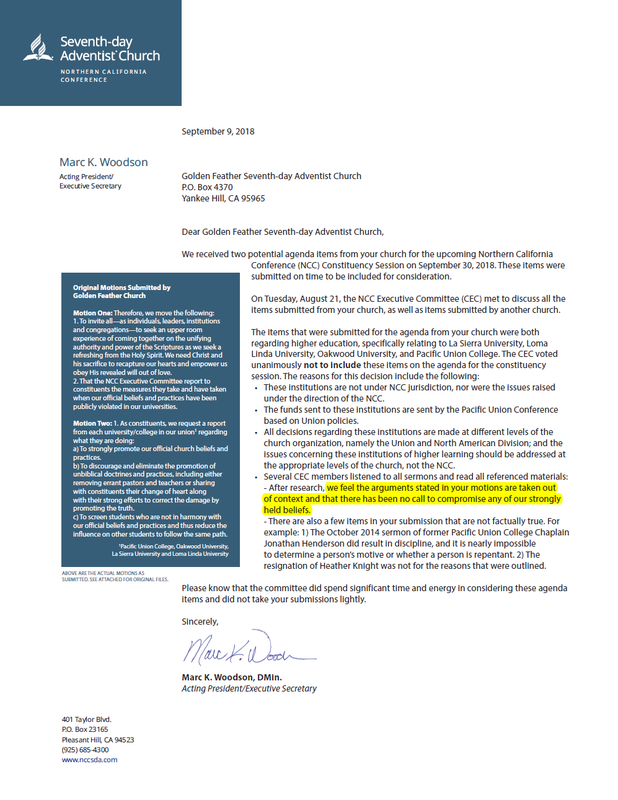 The NCC officers (including Marc K. Woodson) steadfastly refuse to biblically deal with the Chico Church—a church that has welcomed into membership two active lesbians who now have a child they are raising as a ‘married’ couple. Mark K. Woodson’s letter and the Motions here. Bottom line, if your motion is conservative; if it seeks to address worldliness in the Church; if it calls for biblical discipline and adherence to biblical standards, it has no chance of passing in the NCC or Pacific Union Conference. Zero. The 2018 NCC Constituency is Sunday, September 30th.